Staying alone can be pretty scary at times. It becomes scarier when you stay in a quiet building on the hills, with big trees and bushes at the back. However, it gets worse when all these are accompanied by thunderstorms! Some people tend to enjoy the creepy feeling and the sudden doses of lightning. Some people are too preoccupied to even notice them. And some people find this an excuse to cuddle with loved ones. I thought I belonged to the first category, and partially to the third. But never did I think that a time would come when I would be scared of them. So, in an attempt to stay calm and not think about these devilish lightnings, I sit here and.. well.. write about thunderstorms! I remember running out to the balcony whenever there was a thunderstorm back home. The roar of thunder, those lightning flashes and later the torrential downpour intrigued me to no extent. Baba accompanied me often outside, while Ma and brother always remained cuddled inside. There's a common saying in Bengali which goes like this: "jhawr hole sankh banja" which literally means "in times of thunderstorms, blow the conch shells". As a kid, I never understood the correlation between these two. It was only in my teens that I got to know what the saying actually signifies. In our culture, conch shells are viewed as having distinctive spiritual qualities. It is believed that the sound emitted from the conch shell shall dispel any surrounding negative energy and purify the environment. Back home, whenever there was a thunderstorm, one could hear conch shells being blown in every house and then gradually the thunderstorm would stop! On most of these days, Ma made 'khichuri' afterwards with fried eggs and aubergines and we savored every last morsel. Sadly, the next day would always be a mess, with reports on fallen trees, destroyed roofs, broken wires, damaged buildings and injured people. In the last one and a half years that I have been in Germany, I have never experienced such a thunderstorm. Rains are quite a rarity here, let alone storms and lightning. However, today was strangely different from all other days with almost an hour of thunderstorm. Maybe it's sole intention was to scare me and then teach me how not be scared even when I was alone and had no one beside. Or maybe to teach me how to stay calm and keep the mind distracted, rather than calling up friends for compassionate comfort. Whatever it was, it seemed to work pretty fine. I never realized when the thunderstorm and lightnings stopped and the sky cleared :) One more lesson in self-dependence passed!! 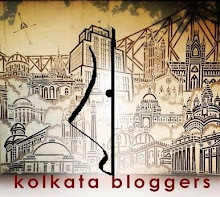 Hi..I am writing to you from the city of joy, Kolkata..as I write, it is raining outside with severe thunderstorms..and as expected, the neighbourhood is resonating with the sound of conch shells being blown..this led me to search online for the origins of such a practice and I chanced upon your extremely well written article..do you know if there is a scientific basis for such a practice?? Will be glad to get some insight..